This morning was cold and crisp as I travelled west towards the Wah-Wah Valley for day two of my second stint of winter raptor surveys. En route my eyes caught a familiar form in a stream system running tandem to the road. Highlighted by the first light of a clear but cool December day was the Great Blue Heron. The sight of the “Sentinel” promised a good day with plenty of birds. I drove on with a settled spirit and a refreshed mind. The day went well. I saw many more birds than I had even hoped for. Time passed easy and I felt grateful for solitude and my time with the birds. After the survey ended, I found myself rolling along the open roads with the glow of the falling sun highlighting the mountain giants of the high desert. The scene was breathtaking, as it so often is in the west. I made my way through the farmlands toward Beaver, with a keen eye on the wheel lines and skeleton trees that run alongside the road. Many birds occupy these areas in winter, and even with a day full of sightings, I was open and ready for more. My eyes soon caught the familiar odd shape breaking the pattern of the wheel line. As I neared I knew that the bird watching the glowing fields in the long light of dusk was different from the usual Buteo. With a round head and long wings was the very bird I had so recently finished painting. 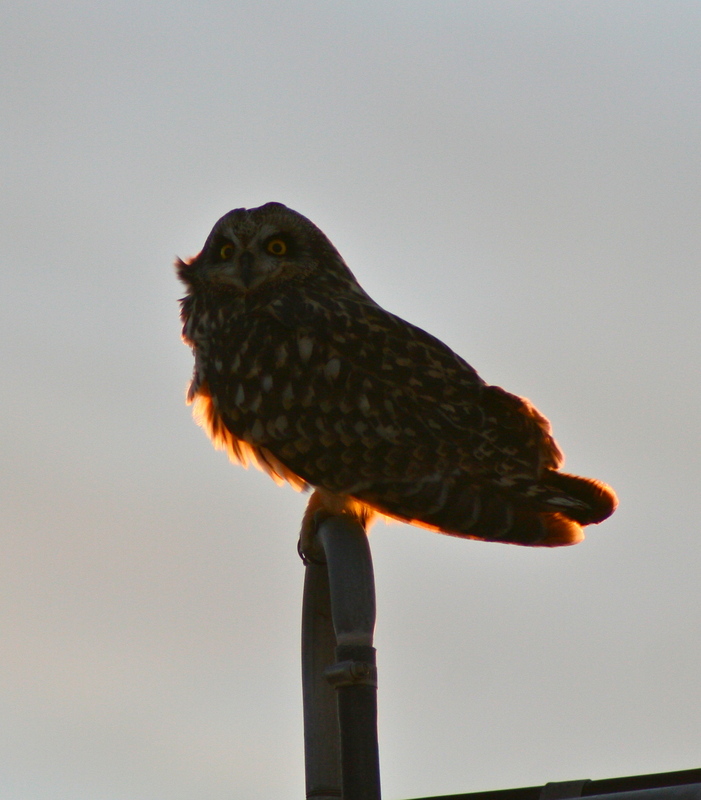 With the realization of the Short-eared Owl alongside the road, excitement leaked from my body as I prepared to meet for the first time in years, Asio flammeus. Normally, raptors are rather wily and do not let you very near, but this owl tolerated me till I was within twenty meters of his eyes. I sat for ten minutes firing my camera and observing the striking creature. His head turned and turned as it surveyed for prey. I felt frustrated that the sun sat behind the bird, but I took nothing for granted and photographed the bird nonetheless. Unable to contain myself, I slowly opened my car door to step toward the bird and perhaps get around for a shot in better lighting. 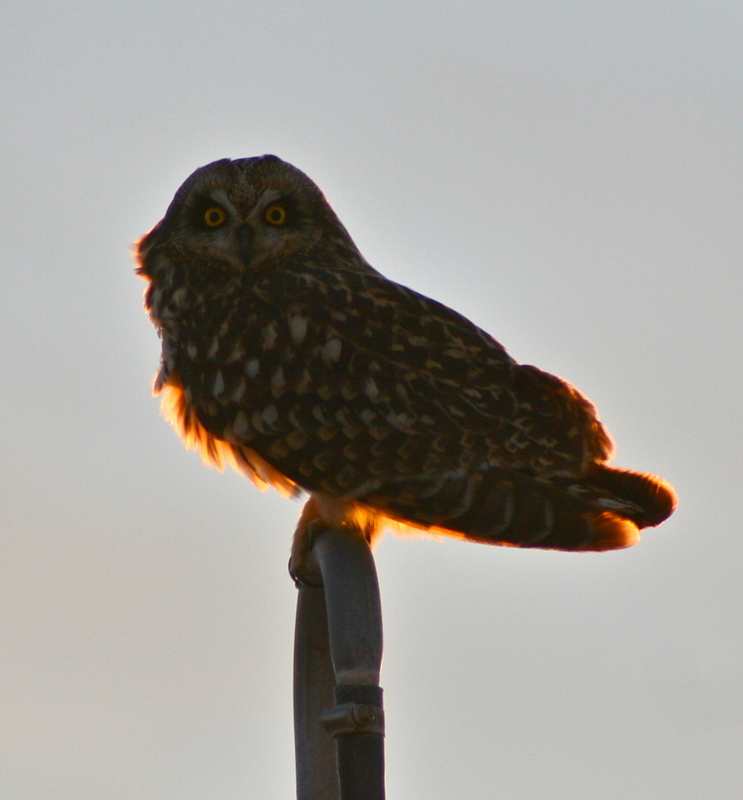 My careful actions became too much for the owl, and he retreated into the glowing landscape of the falling sun. I am stricken by the coincidence of finding the bird in such an unlikely place only days after finishing my painting. 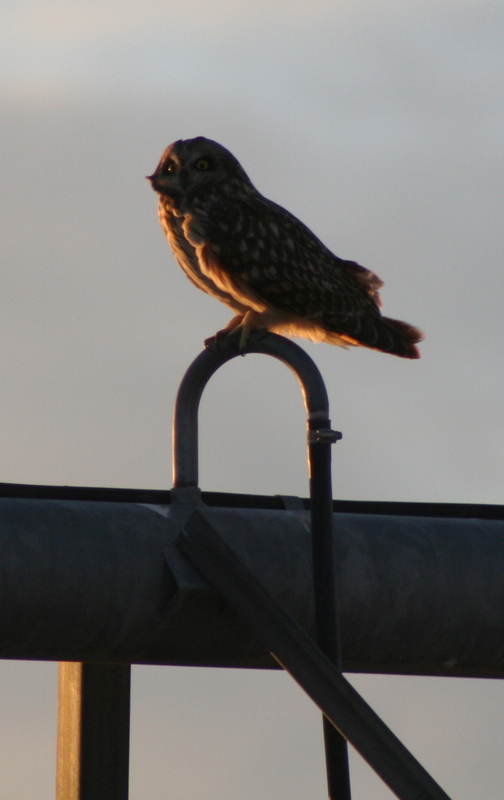 Nevertheless and no matter the reason, I am grateful to have met Asio flammeus, the Short-eared Owl.